About a month ago, former Youngstown Club Executive Chef Anthony Palumbo joined the ownership team at the "Dooney's Downtown" establishment - and introduced a menu upgrade that has many downtown lunch patrons taking notice. "It's pub food done right," says Palumbo. "Nothing is frozen. All of our sauces are made in the kitchen, and everything is made to order." When asked what the specialty sandwich of the house is, the marinated prime rib sandwich was identified as a top contender. But what makes the sandwich unique compared other other places serving sandwiches downtown? First off, the buns come from a Syrian bakery in New Castle, Pennsylvania, purchased every other day. The prime rib is roasted in-house. The coleslaw for the topping is made after the order is placed, incorporating large pieces of cabbage. The cheese is fresh mozzarella and melts over the beef. The fries are fresh-cut, and seasoned as requested. Another point of pride for Chef Anthony is that all their chicken is brined for a day before cooking. The tenders are hand-breaded. The wings are baked before a quick fry, and all get dressed with their homemade sauces. For example, the BBQ sauce is made with honey and pineapple juice. The Buffalo sauce is made with balsamic vinegar. 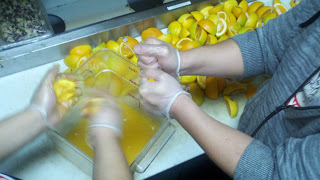 The Sriracha Orange sauce is made with fresh-squeezed oranges. All the burgers are made with Catullo's meats. 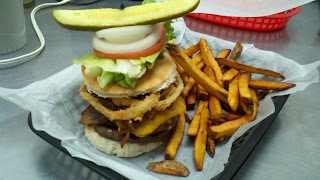 Here is the stackhouse burger, topped high with two onion rings and a sampling of their pulled pork. Chef Anthony contends new entries will be coming to their changing menu in the coming weeks. With the new attention to the food, it will be interesting to see if Dooney's can elevate their game in the long run. Perhaps in the coming months the establishment known for the "worst business logo" downtown may also be home to the "best pub food" downtown.